Pocket-safe automatic pencils are designed for precise writing and drawing with a break-resistant lead, a special metal sleeve and ISO color-coding. The tip of the automatic pencil is retractable at the mere push of a button so your pockets are protected. The refillable pencil lead is cushioned, protecting it from breakage. The rigid, cylindrical, metal lead sleeve is ideal for use with rulers and templates. 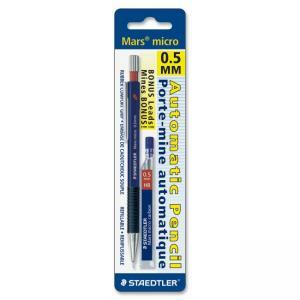 The identical color-coding of these Staedtler Mars Micro automatic pencils, mechanical pencil leads and technical pens facilitates recognition of the different line widths. Automatic pencil also features a nonslip rubber grip zone, metal pocket clip, push-button plunger on top and refillable, PVC-free, latex-free eraser. Pencils are easy to refill with 12-a-go Mars, micro carbon, automatic pencil leads.